WiFi Finder is a free app by Avast for Android to find free and public WiFi hotspots. 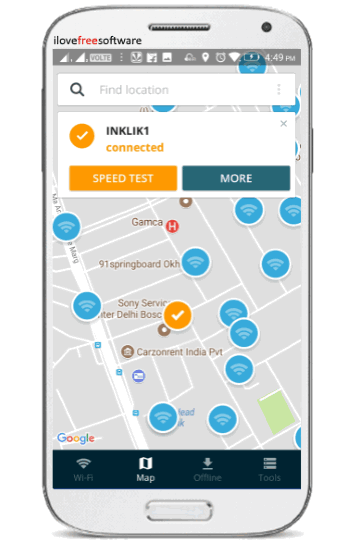 Using this app, you will be able to easily find and connect to nearby WiFi hotspots which are completely free or open to use. When you open the app, it automatically scans the surrounding of your current location to find public hotspots. It shows all the fast and reliable hotspots which are in range as well as in walking distance. The best part is that you can see the hotspots on a map and it also helps you navigate through the location of the hotspots. Similar to some of the core WiFi Finder services (like Getwi.fi), this app makes it very easy for you to find and use public hotspots in order to save your mobile data. Apart from finding hotspots, it also comes with some additional features using which you can check the security of the connected hotspot, see devices connected to a hotspot, perform speed test, and most importantly find hotspots when offline. 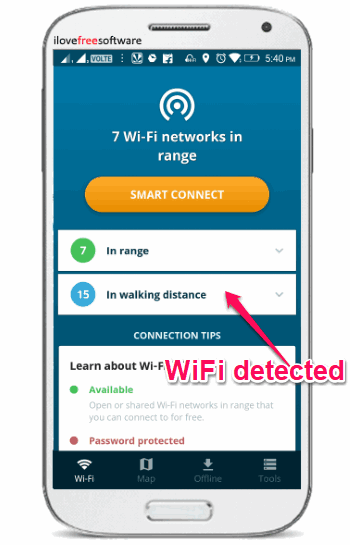 Note: The WiFi Finder app is also available for iPhone and iPad, but I have only tested and reviewed the Android app in this post. To get started, simply install the “WiFi Finder” app on your Android phone and open it up. The download link is provided at the end of this post. After you open it, simply click on the “Continue” button and then it will automatically start scanning for free and public WiFi hotspots near your current location. When it is done scanning, it will display the hotspots in two different categories named, “In Range” and “In Walking Distance”. If it finds any free hotspots in range, then it will ask you to use the “Smart Connect” feature. 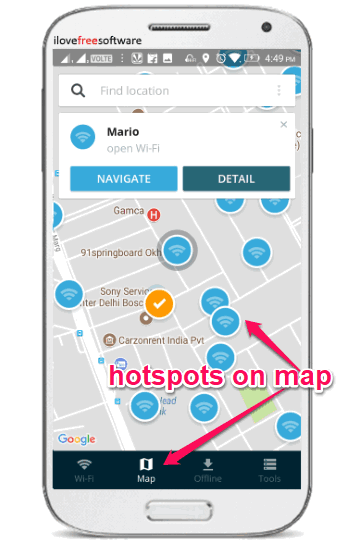 This feature automatically picks the best hotspot in range and connects your phone to it. But, if you don’t want to use this feature, then you can manually choose the hotspot to which you want to connect. Apart from seeing the list of the WiFi hotspots in the categories, you can also see them on a map. For this, tap on the “Map” tab at the bottom. Once you do that, you will be able to see the exact location of the hotspots on the map. Now, if the hotspot is in the “In Walking Distance” category, then you can simply tap on it and then select the “Navigate” button to go to the hotspot location. Once the hotspot is in range, you can simply connect to it. 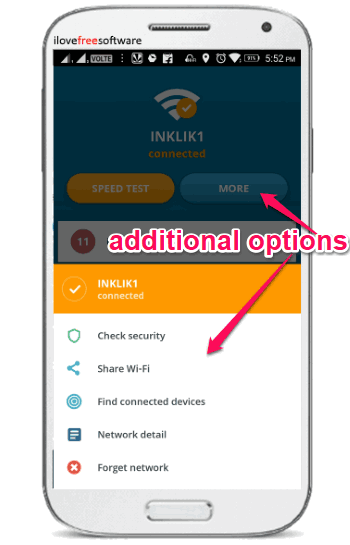 After connecting to a WiFi hotspot, you can also perform various actions including security check, share WiFi, find connected devices, see network details, and speed test. To use all these features simply tap on the “More” button which will be visible at the top of the screen when you connect to a network. The “Speed Test” button will be visible on the left of the “More” button. Another interesting and useful feature of this app is “Offline Mode”. It allows you to find free hotspots without actually using your mobile data. For this, you would need to tap on the “Offline” tab at the bottom and then hit the “Activate Now” button. After that, it will ask you to select your country and then download the list of WiFi networks to your phone. As soon as you do that, you will be able to find free and public hotspots near your location even when your phone is not connected to the Internet. WiFi Finder by Avast is a very useful app which makes it super simple for you to find and connect to free and public WiFi hotspots. 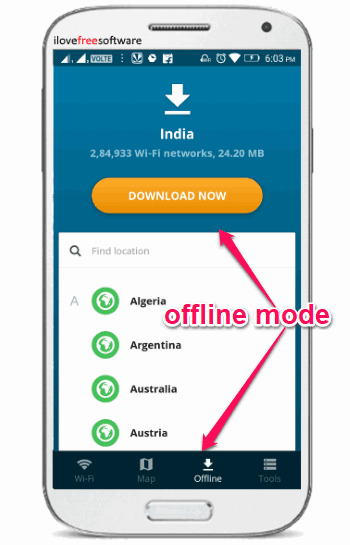 No matter in which country you reside, if any free WiFi hotspot is available near your location then this app can probably show it to you. Personally, I like it as it also offers various additional features including speed test, security check, etc. Get “WiFi Finder” for Android. Get “WiFi Finder” for iPhone/iPad.